Are you a rhubarb fan? I was just introduced to it last year via our CSA. Honestly, it’s one of those things that kind of scared me – I just didn’t know what to do with it. I’m so glad I got over my fear! One thing I’ve passed on to my kids is my love of cookbooks. They already have their own little stash that they love flipping through – and they love to pick out their own things to make. I try to always say yes when they want to make something out of their books. Of course this one I said yes to before looking at the recipe. Every year, I say I’m going to make something savory to celebrate – and every year I get seduced by some awesome looking dessert. This year, it was grapefruit pie. 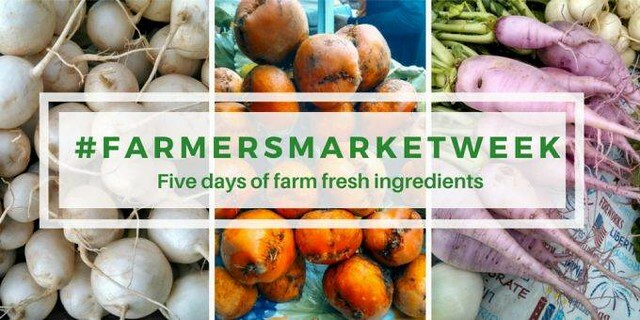 Today I’m kicking off Farmer’s Market Week and I couldn’t be more excited! With the mid-summer move this year, we never got our garden going, so we’ve been relying heavily on our CSA farm all summer – and we’ve been eating well! I can’t wait to show off what I’ve been making to use our farm share ingredients, and I’m excited to be linking up with other blogger friends all week – you can check out today’s batch of recipes below. It’s sure to be great inspiration for you and me! 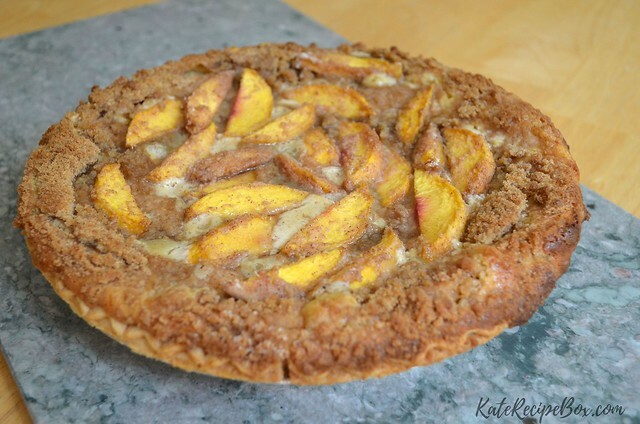 I’m starting the week off with this gorgeous peach pie. This is actually a recipe that I made a few years back and regretted not photographing for the blog – it’s delicious. And since it’s served cold, it’s really perfect for a hot summer day. The fresh peaches pair wonderfully with the creamy sour cream base and the crunch of the brown sugar topping. 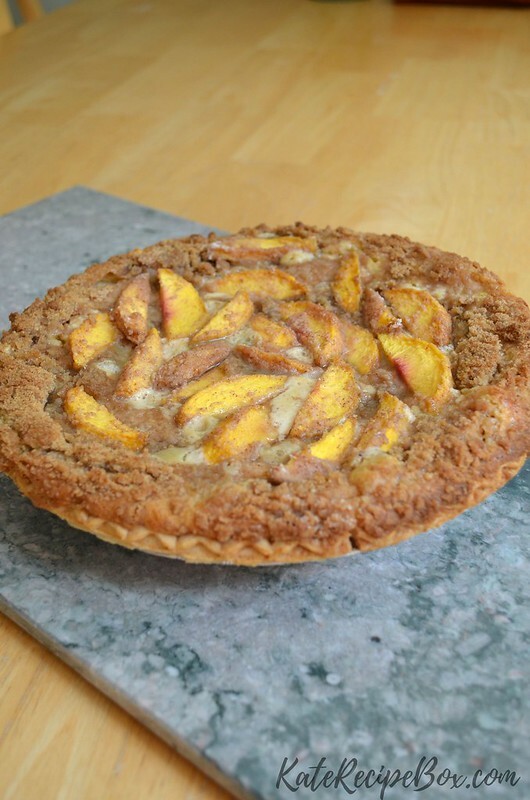 Really, guys, go grab some peaches and make this – you need a slice in your life! Preheat the oven to 400 degrees and prepare your pie dough in the pan. Using a hand mixer or stand mixer, whip the egg yolks until light in color. Using a spoon, stir in the flour, salt, sugar, nutmeg, and cinnamon. Stir in the sour cream and vanilla until well combined. Fold in the peaches. Pour into the prepared pie crust. While that bakes, make the crumb topping: whisk together the brown sugar, flour and cinnamon. Cut in the cold butter until pea-sized crumbs form. Then, make the peach topping: Whisk together the sugar, cinnamon, and flour. Toss the peaches in until coated. Remove the pie from the oven, and cover with the crumb topping. Press the peaches in around the top of the pie. Return to the oven for 30 more minutes. If the crust starts to brown too much, cover it with foil. Remove from the oven and let cool, then transfer to the refrigerator for at least 3 hours to firm up. Oh, what a week it’s been here! Why is buying and selling a home so stressful?! Isn’t there a better way to do this? If you’re thinking, “Wait! I didn’t know you were moving!”, don’t fret – we’re not even sure we are. But we did happen upon a house we just love so we’re doing everything we can to make it ours. The past week has been an endless parade of offers, showings, back-and-forth with lawyers/realtors/mortgage brokers… I’m emotionally spent. And, do you know when everyone wants to look at your house? DINNER TIME! We’ve been fast-fooding it up. Jake has declared McDonald’s his favorite, and I’ve been going with it because it means I get a shamrock shake. Those things are seriously like stress relief in a cup. When I started flipping through pie recipes to celebrate today with, this one jumped out. A pie version of my beloved shake? Too good to be true! But this is actually a really close to the real thing taste-wise – and you could totally freeze the pie to make it even closer! 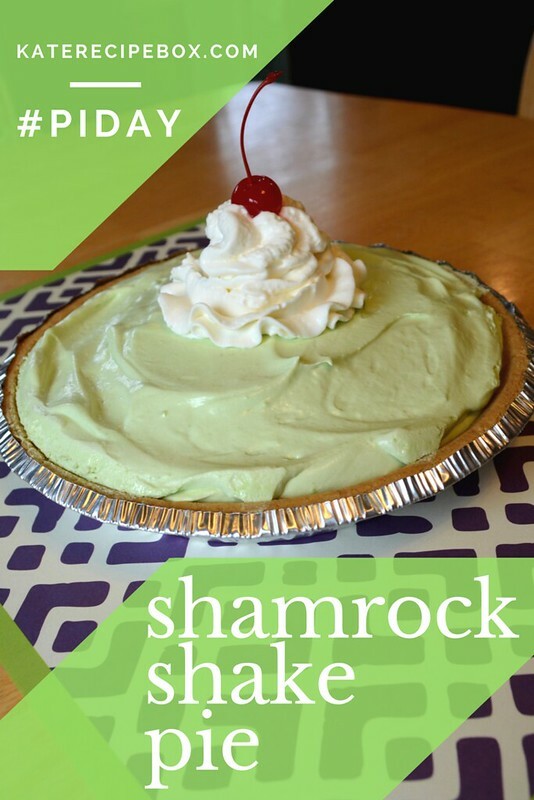 Everyone here loved it – and with only a few ingredients and about five minutes to prep, it’s a no-brainer if you’re having a crazy week like I am but still want to do a little celebrating – either for pi day or for St. Patrick’s Day! Looking for more Pi Day inspiration? The Redhead Baker is hosting an awesome link-up of pie recipes – both sweet and savory – from lots of bloggers! In a large bowl, whisk together the pudding mix and the milk until the mix is dissolved. Stir in the food coloring (about 15 drops), and the mint extract. Fold in the frozen whipped topping until no longer streaky. Transfer to a graham cracker crust and refrigerate for at least 4 hours. Top with whipped cream and a cherry before serving, if desired. It’s been a while since we had something sweet around here. Would you like a slice of pie? This was actually our pi day pie. Made in the middle of the Nor’easter. I knew we’d be stuck in the house, so I picked a pie that Jake could help with. We all really enjoyed this and while a frozen pie wasn’t necessarily the best choice for a snowstorm, it’s going to be perfect for summer barbecues! Using a stand mixer or hand mixer, beat together the cream cheese, powdered sugar, and vanilla until well combined and smooth. Stir in half the container of Cool Whip. Stir in 6 chopped Oreos. Spread mixture in the premade crust and freeze for 3 minutes. Place chocolate chips in a heat-proof bowl. In a microwave-safe container, microwave heavy cream until just starting to bubble. Pour over the chocolate chips and let stand for 1 minute. Whisk together until smooth. Let cook to room temperature. Pour over the top of the pie and smooth out. Spread remaining Cool Whip over the pie and then sprinkle remaining chopped Oreos over. Cover and return to the freezer for 1-2 hours. Remove a few minutes before serving. This pie, you guys, this pie. I whipped this up for my husband’s birthday and I’m pretty sure it was more well-received than any cake I’ve made him. It’s hard to argue with creamy peanut butter, chocolate and an Oreo crust. 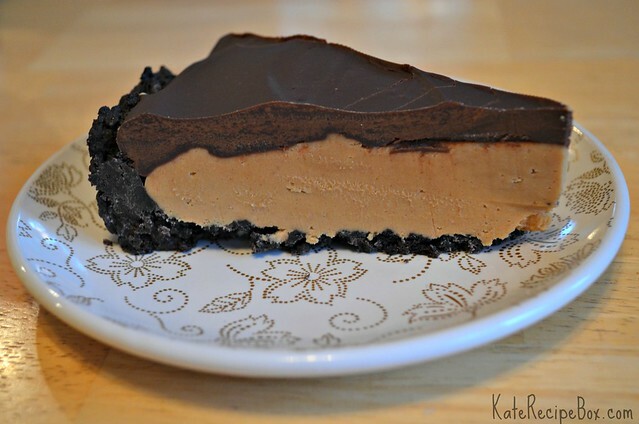 If you’re a chocolate-peanut butter lover like me, you need to make this ASAP. It’s really just that good. Crush the Oreos in a food processor or with a rolling pin. Stir together with 1/2 cup melted butter. Press into a pie pan or spring form pan. Freeze for 10 minutes or until set. While the crust is in the freezer, beat together the remaining butter, 1 1/2 cups peanut butter and 1 cup of powdered sugar, until smooth and creamy. Spoon into the crust and gently smooth. Place back in the freezer. In a heat-proof bowl, add the chocolate chips and remaining peanut butter. In a saucepan, bring the whipping cream to a rolling simmer over medium-high heat. Pour the hot cream over the chocolate chips and peanut butter. Let stand for 5 minutes and then whisk until smooth. Pour over the peanut butter layer and smooth out. Refrigerate, covered, for at least an hour before serving. I’ve been taking a step back from blogging lately. This has always been a hobby for me and when it starts to feel like a chore, I know it’s time to take a breather and wait until I feel excited about it again. This time, inspiration struck in the form of a Facebook post. My friend, Caitlyn, posted the video for these and since I had everything in the house already, I just had to try them out. These came together easier than I was anticipating and they looked awesome. I made them in cupcake tins, but I think if you doubled the recipe and put them in round cake pans they would work great as a pull-apart dessert. They were also good reheated in the oven. If you’re looking for a different take on apple pie for Thanksgiving, this is a great option! Preheat the oven to 375F degrees. Spray a cupcake pan with nonstick spray. Place the apple slices in a bowl and cover with water. Add lemon juice, toss to coat. Microwave on high for 3 minutes then set aside. In a small bowl, whisk together the peach preserves and 2 Tbsp. water. Set aside. Roll out puff pastry until it’s a 12″ x 12″ square. Using a pizza wheel, slice the puff pastry into 6 2″ x 12″ strips. Take one puff pastry strip and brush it with the peach preserves mixture. Place one apple slice along the top of the strip, with the rounded side overlapping the top. Place another slice overlapping the previous slice. Repeat until the end of the strip is reached – the top should look like a scalloped edge. Sprinkle with cinnamon sugar. Carefully fold up the bottom of the puff pasty strip to form a pocket for the apple slice. 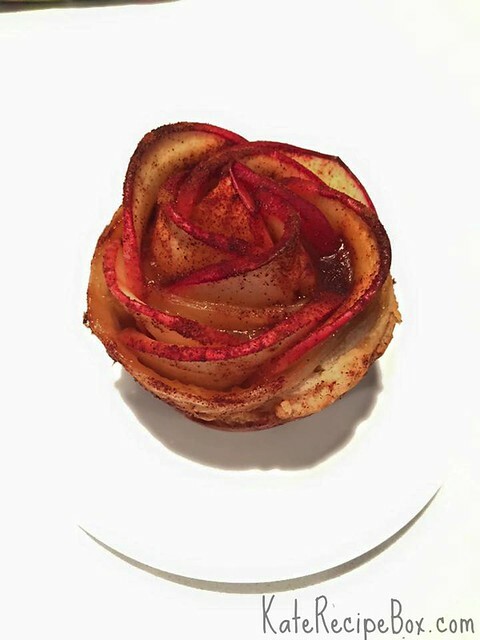 Starting from one end, gently roll the puff pastry to create the look of a rose. Press the end together and place in the prepared cupcake pan. Repeat 5 more times, until all the strips are used up. Sprinkle again with cinnamon sugar. Bake for 35 – 45 minutes, until golden. I’m surrounded by nerdy love. My cousin was posting Pi Day memes on Facebook yesterday. My Mother-in-law owns a Pi pie plate I couldn’t let the most epic Pi Day this century pass without some acknowledgement in the form of pie. I just wouldn’t fit in this family if I didn’t! I love Pop Tarts so this pie was just begging to be made. It’s basically an awesome strawberry pie with an almond-icing glaze. 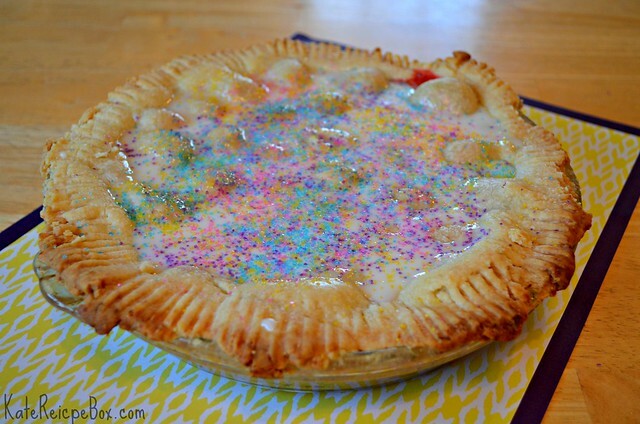 Such a fun pie! We really enjoyed it and I can’t wait to try making it again with fresh berries when the garden starts overflowing. And what’s better than pie on Pi Day? Well, lots of pie – so I’ve joined up with some of my blogging friends to bring you even more pie! Check out what they made to celebrate the most epic Pi Day of the century below. Preheat your oven to 400F degrees. Squeeze out the grated apple, removing as much liquid as possible. Set aside. In a saucepan over medium heat, cook 3 cups of the frozen strawberries, stirring often, until the berries have become jam-like and reduced by half, about 15 minutes. Remove from heat and stir in the grated apple, remaining berries, sugar, tapioca and salt. Stir to combine. 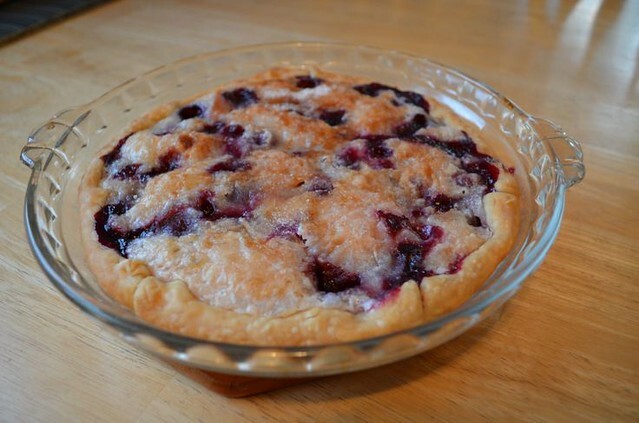 Roll out one pie crust and lay in a 9″ pie pan. Spoon strawberry filling into the pie dough and dot the top with the cut up butter. Cover with remaining pie crust sheet and crimp edges with a fork to seal. 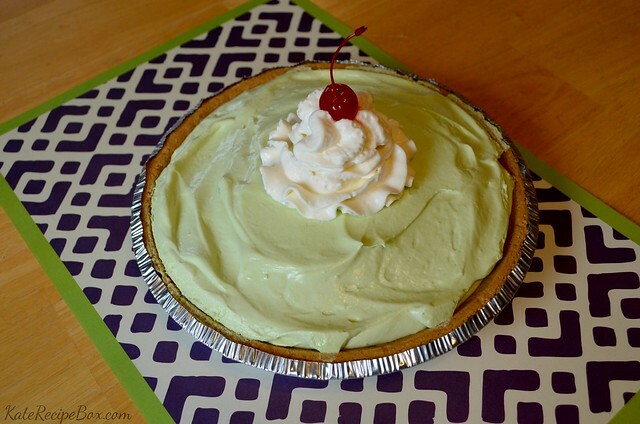 Place the pie on a baking sheet and bake 30 minutes. Reduce oven temperature to 350 and bake for an additional 30 minutes, or until the crust is golden brown. Let cool on a cooling rack for several hours. When room temperature, whisk together the powdered sugar, almond extract and milk and drizzle over the pie. Decorate with sanding sugar and serve! 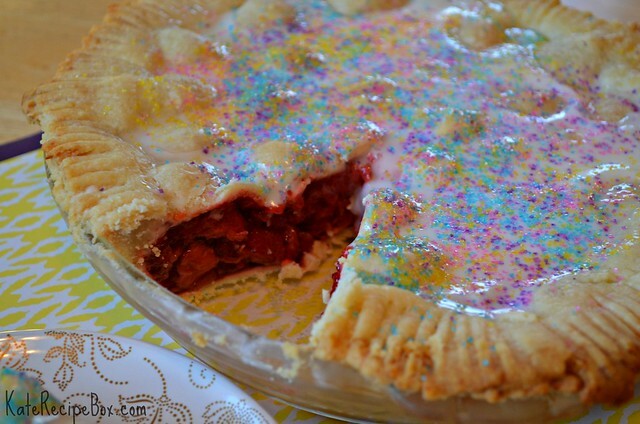 This strawberry sour cream pie is probably my favorite pie – I make it during strawberry season every year. A few weeks ago when we ended up with a ton of cherries, I decided to try the pie in a cherry version and it was just as good. It’s a tiny tweak to the recipe but definitely worth sharing! Preheat oven to 450F degrees. Whisk together the flour, sugar and salt in a large mixing bowl. Add sour cream, blending until creamy. Gently fold in the berries without over-mixing. Pour mixture into pie shell and spread to edges without packing down — there should be spaces throughout the filling. Sprinkle the top with the last 1 tablespoon sugar. Bake the pie for 10 minutes, then reduce the heat to 350F degrees (leave the oven door open a minute to let the temperature drop a little) and bake an additional 30 minutes or until crust is golden brown. Broil the pie for 2-3 minutes to brown up the top. Allow to cool completely before cutting.